1203 W Augusta Blvd, Chicago. New construction condos for sale in River West. Exclusively listed by Brent Hall and Jameson Sotheby’s International Realty. 1203 W Augusta is a collection of six 3-bedroom condominium homes in a boutique elevator building by Volo Development. 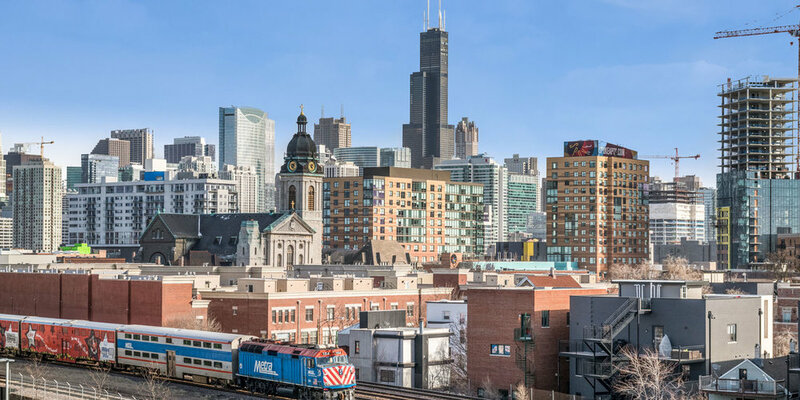 The location, on the boarder of Chicago’s River West neighborhood and the revitalized North Branch Corridor, offers great value for those with a more pioneering spirit and is quickly accessible to the Loop, public transportation and neighborhood amenities. Volo Development draws on years of construction and design expertise to craft high-end homes with versatile layouts, that appeal today’s modern buyers. 1203 W Augusta Showing Request. Thank you for inquiring about 1203 W Augusta. We will be in touch shortly. Three bedroom layouts with open floor plans, extra-wide living rooms, and direct elevator access to the unit, were thoughtfully designed to maximize space and functionality. Floor-to-ceiling- windows in the living room allow for bright living and views from the large front terraces overlooking the city skyline from each unit. When you’re ready to relax after a long day or entertain friends and family, take the elevator to your private roof deck and enjoy 360 degree city views. The kitchens incorporate a transitional style with large task islands, built-in pantry cabinets, high-end Thermador appliances and quartz countertops. Superior unit finishes include LevelRock concrete sound attenuation between floors, oak hardwood flooring, porcelain tile baths with steam shower and heated floors in the large master suite, and Oknoplast windows and exterior doors. All units are wired for surround sound, CAT-5 and cable and come with additional storage and heated garage parking. Baths // 1.25" quartz countertop with square undermount sinks. Porcelain floors & shower walls. Floors, Doors & Trim // 3 1/4" Oak hardwood floors. 8 ft. solid-core, 1-panel doors. 5 1/2" white baseboards. 1600 SF unit with 3 bedrooms and 2 baths. East, south and west exposure. Open floor plan with 22’ wide living room and large L-shape kitchen with built-in pantry cabinets. Master suite with walk-in closet. Unit features include direct elevator access, hardwood floors throughout the living area and bedrooms, floor to ceiling windows in the living room with city skyline views, master bath with steam shower and heated floors, LevelRock concrete sound attenuation between units, front terrace and roof deck. 1-garage parking space & extra storage locker included. 1650 SF unit with 3 bedrooms and 2 baths. East and north exposure. Open floor plan with 22’ wide living room and large L-shape kitchen with built-in pantry cabinets. Master suite with walk-in closet. Unit features include direct elevator access, hardwood floors throughout the living area and bedrooms, floor to ceiling windows in the living room with city skyline views, master bath with steam shower and heated floors, LevelRock concrete sound attenuation between units, front terrace and roof deck. 1-garage parking space & extra storage locker included. 1600 SF top floor unit with 3 bedrooms and 2 baths. East, south and west exposure. Open floor plan with 22’ wide living room, soaring 12’ ceiling height, wrap around skyline views, large L-shape kitchen with built-in pantry cabinets. Master suite with walk-in closet and sunny west exposure. 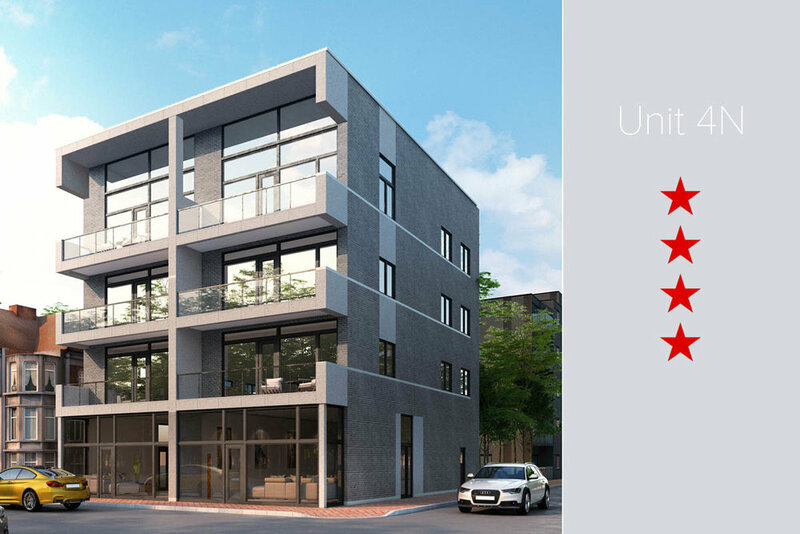 Unit features include direct elevator access, hardwood floors throughout the living area and bedrooms, floor to ceiling windows in the living room, master bath with steam shower and heated floors, LevelRock concrete sound attenuation between units, front terrace and private roof deck. 1-garage parking space & extra storage locker included. 1650 SF top floor unit with 3 bedrooms and 2 baths. East and north exposure. Open floor plan with 22’ wide living room, soaring 12’ ceiling height, wrap around skyline views and large L-shape kitchen with built-in pantry cabinets. Master suite with walk-in closet. Unit features include direct elevator access, hardwood floors throughout the living area and bedrooms, floor to ceiling windows in the living room, master bath with steam shower and heated floors, LevelRock concrete sound attenuation between units, front terrace and private roof deck. 1-garage parking space & extra storage locker included. The River West neighborhood is a relatively small Chicago neighborhood that has seen a resurgence of development activity with new homes, restaurants and nightspots popping up throughout the area over the past few years. River West has attracted residents who are looking for a little more value and space without sacrificing on too many neighborhood amenities. Located between River North, West Loop and West Town, the River West neighborhood provides quick access to the best Chicago has to offer, while it continues to mature as a true destination neighborhood.